Pink Gazelle Productions: Authentic Lives…Authentic Works » What is a Pink Gazelle? Check out this fab Q&A with Angela J Ford and Maryanne Pope – published May 14th, 2015. 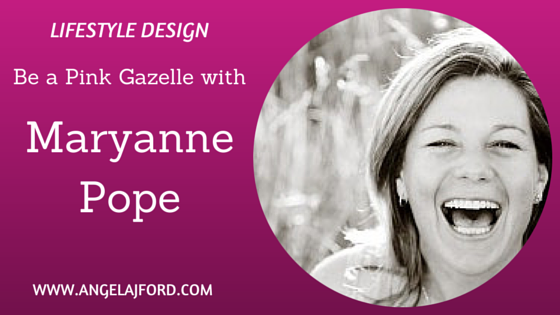 Q: Why did you choose to create Pink Gazelle and what gave you the idea to make it happen? A: I chose to create my company, Pink Gazelle Productions, in 2002, as a means to handle my expenses as a writer. But I soon realized that I wanted my company to be more than a business…I wanted it to be a means by which I could encourage and inspire people, through my writing, to bring about positive change – both in their own lives and in the world around them. The name Pink Gazelle came from a wild experience I had with a friend in the Sahara desert in Morocco. I was in an unhealthy emotional state as my husband had died 6 months before. I learned some difficult lessons about how to stand on my own two feet and take proper care of myself. Mostly, however, I realized I had to learn how to love myself again…how to perceive myself not just as a gazelle (a term of endearment for a woman) but as a pink gazelle – a woman of self-worth with or without a husband. Q: What are some of the obstacles you have faced? Please click here to read the complete Q&A on Angela J Ford’s outstanding website!